The last couple of days our big topic of conversation have been the lovely ladies from the Witch Hunters Codex. I hope you already seen Kristians girls with those nice looking pink coats. Since you voted the Baneblade to be my next project and it's so big I needed a little side-project. So why not dust of my ladies? Witch Hunters was my first 40k army this century. When I played Battle Sisters the last time I bought a Grenadier squad from Forge World to use as Inquisitor stormtroopers. Since I after that only bought Death Korps, I'll do the same thing this time but this time with Elysians. Maybe not so clever but, when look this good you don't have know any thing. This far I have started to paint two minis at the same time. One at my place and one at Kristians residence. 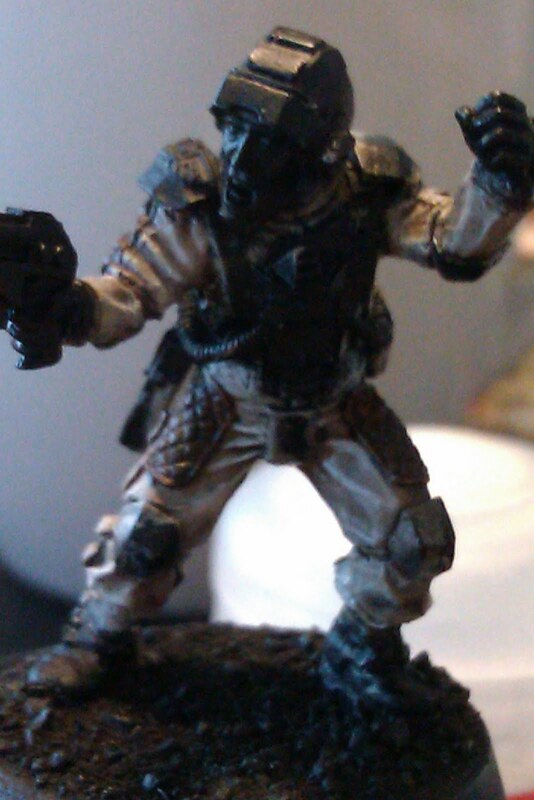 I were looking for a different colour scheme to make them as different as possible to my Death Korps. So absolutely NO grey. The trousers and jacket will be in quite light brown colours. I have not decided about the colour on the armour but it will probably be in dark red. Red for armour! But you already know will paint that way.